"At the two-yard peg she faced round, and said, 'A pawn goes two squares in its first move, you know. 'I--I didn't know I had to make one--just then,' Alice faltered out." When I think of Tweedle Dum and Tweedle Dee, I always think stripes and plaids. Lewis Carroll does not mention the patterns they are wearing, but so many illustrations and movies have clad them in mismatched stripes and patterns. Your challenge this month is to use STRIPES. I made a art journal page of what I imagine Alice's living room wall would look like. She has a trendy mushroom color stripe painted on her walls. I used painters tape to mask off the white areas. Alice's "family photos" wall is made up of a lot of dies to make frames and a frame stamp set I have for the center picture and the mushroom picture. I used copic markers and paint for the violet areas. I think all her living room needs now is a violet couch, some black end tables and a mirrored lamp. Jenny Doh, formerly the managing editor of the famous Stampington publications, has started an artist's community website called CRESCENDOh. There is an online shop selling all kinds of things including charming CRESCENDOh clear stamps, including the Alice in Wonderland by Danita set that the design team is showing off. But the heart of the site is all the stories; stories by artists of all kinds, stampers, quilters, paper crafters. Each shares a tale of how art has changed their life. For some it is a joyous outlet, but for many others it has been a way to stay afloat in times of tragedy or grief. As I thought about this challenge, the theme of STRIPES seemed appropriate. Stripes decorate circus tents and tents of the knights of old. Stripes are birthday wrapping paper and elegant Regency wallpaper. Stripes are the traditional garb of prisoners, and stripes are also how the marks of a whip are described. Stripes can represent so many different things, and the creative process has been many things to the people who have contributed stories to the CRESCENDOh site. Author Jenny Doh is donating a signed copy of her latest book, Art Saves, which is not only full of eye candy but is also full of the stories of how art changes lives. "Discover not only the HOW but also the WHY, through the stunning projects and unique stories of 20 exciting multi-media artists." Thanks so much to Jenny for contributing such a meaningful prize to start off 2012! 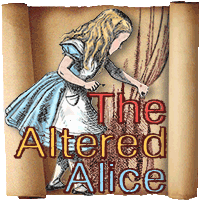 Enter your project at The Altered Alice featuring stripes by Friday, Jan. 27. The winner will be announced the following Sunday. As always, entries that feature Wonderland will have two chances at the random drawing instead of one. You may enter as often as you like but each entry must be on a separate post. All posts must mention and link back to the challenge. Erin that is awesome! Yep she needs a purple loveseat-endtables and a spot of tea!